Maldives, an island nation in the Indian Ocean consisting of twenty-six atolls located around 435 miles Southwest of Sri Lanka has a total land area of 115 square miles and a population of close to 400,000. This archipelago, which in reality are the tops of a vast undersea mountain range, is the smallest country in Asia and the lowest country in the world. Rising sea level due to global warming is a real concern that Maldives is considering to purchase land in either India, Sri Lanka or Australia for its people. Tourism is the biggest sector of its economy followed by fisheries. Tourism has also allowed the handicrafts and other cottage industries to gather momentum. They have the highest GDP per capita amongst south Asian countries. Though it is considered a year-round tourist destination, November through May are the driest months. Its beaches and the water related activities pack a mighty punch and can bronze one whatever the weather. Maldive is home to an astonishing variety of marine life – with colorful corals and over 2000 species of fish. Lonely Planet Maldives Country Guide 978-1741790139 $15 Travelers introduction and a snorkeling, diving, and surfing section covering the first 90 pages followed by Male and atolls based coverage. Excellent guide to choose the resort you want to stay in while there. Maldives Travel Map by Globetrotter 978-1845377755 $9 1:500,000 Scale. Also features six detailed area maps an fifteen town plans. The first stamps of Maldives were a set of six stamps released on September 9, 1906 that Maldives overprints on issues of Ceylon depicting King George V (KGV). The set (Scott #1 to #6) catalogs for around $200 mint and around $315 used. Maldives was governed as an independent Islamic Sultanate from 1153 to 1968. It was British protectorate during the period from 1887 to 1965. As a British protectorate, it was a dependency of Ceylon until 1948. The first original issues of Maldives were a set of four stamps released in 1909 showing the Minaret of Juma Mosque near Male. The set (Scott #7 to #10) catalogs for around $10 mint and around $4 used. This was replaced by another set of nine stamps released in 1933 which were reissues of the previous set in different denominations. That set (Scott #11 to #19) catalogs for around $55 mint or used. A set of nine stamps released on December 24, 1950 showing Palm Tree and Seascape. The set (Scott #20 to #28) is sought after and catalogs for around $45 MNH and around $40 used. Coconut palms the national tree of Maldives are integral to the lifestyle of the population. The atolls of the Maldives along with the Lakshadweep and Chagos groups of Islands are the tops of a vast undersea mountain range. 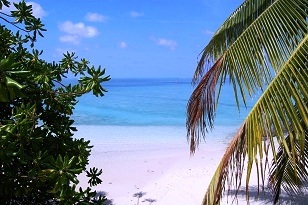 The territory of Maldives is spread over 90,000 square kilometers. A set of eleven stamps released on October 15, 1960 in the History theme. The set (Scott #58 to #68) catalogs for around $15 MNH and around half that for used. The designs show Tomb of Sultan, Custom House, Cowry Shells, Old Royal Palace, Road to Minaret, Juma Mosque of Male, Council House, Government Secretariat, Prime Minister’s Office, Tomb and Sailboats, Tomb by the Sea, and Port. Maldives was a provider of cowry shells for use as international currency. It is now the symbol of the Maldives Monetary Authority. Islam is the only official religion of Maldives and open practice of other religions are forbidden. Conversion of the population to Islam happened around the 12th century and the first mosque was built in 1656. A set of ten stamps and a souvenir sheet of two stamps released in August of 1973 depicting Fish and Ships. The set (Scott #441 to #445 and #446a-b) catalogs for around $30 MNH or used. The designs show Herschel’s marlin, skipjack tuna, bluefin tuna, dolphinfish, red snapper, yellow crescent tail, plectropoma maculatum, like, and Spanish mackerel. The Maldives have a hugely diverse sea life with over 2000 species of fish. The Island waters are also home to the whale shark, the largest living fish species. A long set of fourteen stamps released on December 24, 2002 showing Fish and Birds. The set (Scott #2669 to #2682) catalogs for around $10 MNH or used. The designs show fame basslet, teardrop butterflyfish, Hamburg damselfish, bridled tern, blue-lined surgeonfish, common tern, common noddy, yellow-breasted wrasse, blue shark, Harlequin filefish, orangespine unicornfish, Emperor angelfish, bulls-eye, and scalloped hammerhead shark. Marine life is a very common theme on Maldivian stamp issues and forms a good collectible theme. The first coins of Maldives were pure silver coins minted in Male, the capital in the mid-seventeenth century. Prior to this Cowry Shells and larins were used as currency. The silver coins were replaced by gold coins during the reign of Sultan Hassan Nooruddin in 1787. 19th and early 20th century saw the issue of bronze coins denominated in laaris. In the modern era, Standard Coinage (100 Laari = 1 Rufiyaa) was introduced in 1970 with the issue of Aluminum Laaris. They are common and catalogs for well under a dollar in UNC. Gold Coins of the modern era debut in 1978 with the release of the commemorative FAO issue showing National emblem dividing date in Obverse and Spiny Lobster dividing circle in Reverse. The gold proofs have very low mintage and catalog at a premium to bullion value. Coins $2 and up Common Laaris in UNC start around $2. Year Sets in UNC starts around $15. High Value Silver Proofs from the 1970s onward starts around $50. Paper Money $3 and up Common Rifiyaa UNCs starts around $3. Z Replacements in UNC, Consecutive Notes 10-pieces or more in UNC, etc start around $30. Early Large Notes in VF and higher grades start around $50. Early UNCs from the 1940s, Low Serial Numbers, Specimen Sets, and other Scarce Varieties and Sets go well into the 100s. Lacquer work, replica of dhoni, stamps, and hand-woven mats are the biggest buys of the place. Miscellaneous Collectibles $2 and up Used phone cards, picture postcards etc start around $2. Big posters and 3-D scenes start around $20. Historical press photos start around $50.